More than a year after RERA was formally implemented, we are beginning to see some real impact on the ground. However, the results are still far from scintillating. Out of all the states and Union Territories in India, Maharashtra takes the first place when it comes to proactive RERA adoption, implementation and integration, followed by Uttar Pradesh, Gujarat, Madhya Pradesh and Karnataka. As per the latest registration updates, more than 32,306 projects and 23,111 real estate agents have been registered under RERA across states. Madhya Pradesh has 1,901 projects registered. States such as Maharashtra, Karnataka, Gujarat, Rajasthan, Madhya Pradesh and Punjab have fully-operational RERA. Due to the complexity in laws pertaining to land, north-eastern states such as Mizoram, Manipur, Nagaland, Meghalaya have not implemented RERA as yet, and are examining the provisions. A RERA portal has been launched and interim regulations are visible in the cases of Himachal Pradesh, Uttarakhand, Haryana, Uttar Pradesh, Chhattisgarh, Andhra Pradesh, Karnataka, Tamil Nadu and Bihar. A RERA website is not yet operational in West Bengal, and a committee has been formed to study the Maharashtra and Karnataka model of RERA implementation. Maharashtra, which has penalised many reputed developers recently for advertising unregistered projects and not having the project address updated on the RERA website. 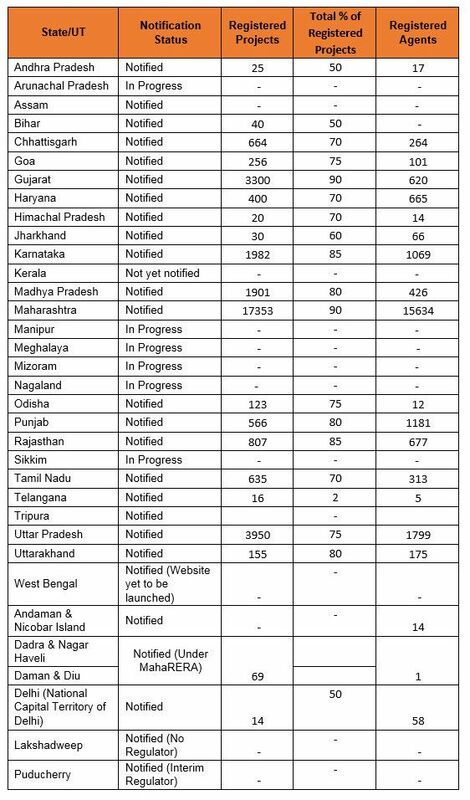 In Karnataka, the 2nd most active state in implementing RERA, where the RERA cell has sent notification letters to 100-130 projects in Bengaluru for not registering under RERA in 2017. 953 project applications are still under investigation. Despite some encouraging number, it is evident that RERA has not been adopted in the manner and to the extent the Centre originally intended. In some states, there have been serious developer-favouring dilutions of the clauses meant to protect the interests of buyers. Delay in project execution because of dilution of RERA, and the overall signal such dilutions send to the market will act as a dampener on buyers’ confidence. This, in turn, will affect developers’ ability to sell. There can certainly be circumstances under which a project can be delayed for which the developer cannot be held responsible. Among such extenuating circumstances, the failure by concerned Government authorities to furnish timely development permits without good reason probably counts the highest. The effect that the more recent amendments will have depends on how different states interpret the concept of ‘exceptional and compelling circumstances’. RERA must define such circumstances clearly and satisfactorily to end-users and investors. Also, Government agencies dealing with project clearances should be brought under RERA’s ambit, as well. If RERA is to bring in genuine accountability, the accountability must be unilateral, not one-sided. While many states are still in the process of notifying their RERA rules, there has been continuous fretting about the dilution of the rules recently notified by many states. In fact, there are multiple changes made by different states in the RERA proposed initially by the Central Government. Dilution in ongoing projects’ definitions has left a huge number of projects out of the RERA ambit, and this is understandably a major concern for buyers. To live up to the spirit of RERA, the Government must ensure at all costs that the RERA rules remain aligned and effective across all the states while balancing the interests of both buyers and developers.